Kachemak Bay Flying Service (KBFS) recently moved its Part 141 flight training and Part 135 On-Demand Transport operations. S3’s wholly-owned subsidiary for commercial aviation operations did not leave Draughon-Miller Airport in Temple, TX – just moved these operations to the other side of the airport to Hangar 11 where flight training and transport are now only two doors down from KBFS’ Part 145 Avionics Repair Station. KBFS sought to move operations during the late summer to more closely consolidate administrative and management functions for the multiple certificates it currently holds from the Federal Aviation Administration. 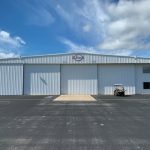 In the near future, once approved by the FAA Flight Standards District Office in San Antonio, the Part 145 Repair Station will also occupy Hangar 11, leaving Hangar 10 to accommodate only general aviation inspections and maintenance. This consolidation in Hangar 11 will have the needed side effect of allowing faster scheduled services for aircraft owners who require work not associated with avionics. All avionics installations and repairs will occur in Hangar 11 once FSDO approval is received.